The rotorcraft technique of the Gyroplane or Autogyro was developed in 1919 by a Spaniard named Juan de la Cierva and the Gyroplane as such flew for the first time on 9th of January 1923 in Madrid. This technique later developed into the Helicopter. 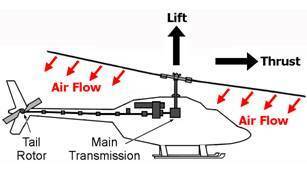 Like the helicopter the Autogyro uses a rotor system to produce the required lift. This rotor is driven by aerodynamic forces in autorotation and is not driven by the engine. The engine drives a propeller which provides the driving force to keep the Gyroplane in the air. Gyroplanes cannot stall and can fly low and slow. Their maximum speed is similar to other aircraft using a rotor system. They have a lower fuel consumption and can usually take fuel for up to 5 hours of flight. Because of the piston (or electrical) engine and its low fuel consumption the CO2 pollution footprint is much lower than, for example, the CO2 footprint of a helicopter. Also, the noise emissions are much less. Due to their light weight, gyroplanes can be transported by road on a trailer. The required maintenance for the gyroplane itself is minimal and can be done by the operator itself. This results in overall lower operating costs. Gyroplanes are very safe aircraft's. 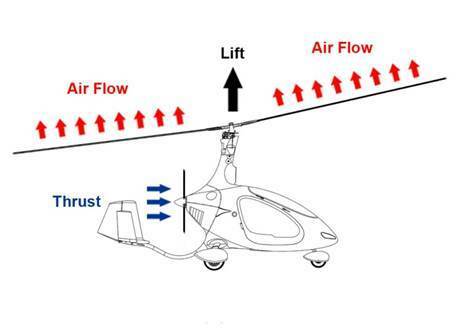 In case of an engine failure, the rotor will continue to rotate and there is no action required by the pilot to maintain rotor RPM. Because of its ability to land without forward speed, emergency landing will be safe and controlled with the gyroplane and its crew undamaged.